Shield Africa 2017 closed doors on January 26th, after a very successful fourth edition, held in Abidjan, Cote d’Ivoire. The top African International Security and Defense exhibition brought together many attendees, most of them from Africa. The number of exhibiting manufacturers has increased from 46 in 2015 to 133 in the 2017 edition, coming from 24 countries all over the world. 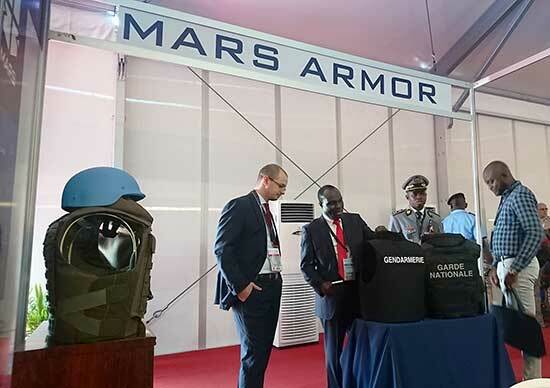 The exhibition was held under the patronage of the State Minister, Home Affairs Minister and benefited from the support of the Defense Minister of Cote d’Ivoire. Company MARS Armor reached out to new partners and clients, who had the chance to explore the product range (of bulletproof vests, hard armor plates, shields and ballistic helmets) of the company and familiarize themselves with the innovative ballistic solutions for all levels of protection at minimum weight developed by MARS Armor Ltd.